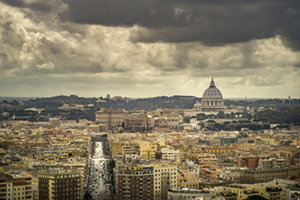 Travel journalist and photographer Gavin Gough embarks on a pilgrimage to Rome. I am standing on the summit of the Monte Mario, one of the highest vantage points in Rome, looking out upon the wide expanse of the ancient city. The dome of St. Peter’s Basilica is the only architectural form climbing above the horizon, identifying the location of the Vatican City and my final goal. My legs are tired, my feet are weary from several days’ walking but this view is one that I have anticipated for many weeks and, now it’s finally here, I’m going to try and savour the moment. Some considerate soul has ensured that there’s a seat available for weary travellers so I sit and pour the last hot water from my flask and soak up the view whilst sipping a rather splendid Darjeeling tea. Right here, right now, I am quite content. I remember to register the emotion, trying to ‘live in the moment’, which, I am told, is a good thing. I’m very near the conclusion of a six-day, 120-kilometre walk from Viterbo to the Vatican, the final leg of the Via Francigena. The ancient pilgrimage walk starts 2,000 kilometres away in the English cathedral city of Canterbury, passes through England, France, Switzerland and Italy and has been trodden by pilgrims since medieval times. The genesis of my desire to walk at least a relatively small section of the entire trail was born from an awareness of how our modern, stopstart lives rarely afford the luxury of daydreaming. City life seems to be driven by short-term goals. Buy milk. Call office. Book lunch. Meet friends. Get fit. Read Facebook. Post selfie. Update. Tweet. Is this staccato lifestyle at odds with our mind’s natural rhythm? Whilst the romantic notion of wandering through meadow and woodland appealed to me, I was aware that middle-aged men who are, shall we say, not quite at the peak of physical fitness, might benefit from a little organisational support. Fortunately for me, Francigena Ways tour company will not only book all the accommodation you require along the route, they’ll also arrange for somebody to collect your luggage each day and deliver it to the next hotel or Agriturismo, leaving me free to carry only a map, a compass, those items necessary to fend off any spring rain showers and some essential tea-making paraphernalia. I left my hotel with a spring in my step and new walking boots so shiny they would have made an army drill sergeant beam with pride. Neither my step nor my boots retained their shining lustre for very long. Beginning the official section of my leg of the pilgrimage route at Viterbo Cathedral, I was encouraged to be greeted by an interior with a single, shining beam of light coming through a southerly window. I have good friends who would knowingly claim this to be a favourable sign so, abandoning my reason for a moment, I took it to be so and stepped onto the path with a sense of divine guidance. Perhaps it was that or, more likely, because of the up-to-date maps and provided GPS routing, I’m proud to say that I didn’t get lost once during my walk to Rome. The path is well signposted and soon leaves the towns behind and takes pilgrims through olive groves, across meadows and onto charming woodland paths. Despite the inevitable aches experienced by muscles unfamiliar with six to seven hours of constant activity each day, long distance walking does have a rejuvenating quality. Perhaps it’s a combination of the repeating rhythm of thousands of footsteps, the slightly elevated pulse and measured breathing. Walking a path necessarily removes many of the concerns we experience in everyday life. There is only one path so there’s no need to choose between equally appealing options. Food is eaten when it’s available and there’s no need to book a table, just collapse beside the most attractive looking olive tree. There are, in essence, very few decisions to be made, leaving the walker free to saunter along, happily day dreaming. During my six-day pilgrimage, I was able to enjoy satisfying, imaginary conversations will all my friends and relatives. I practiced acceptance speeches for major awards, including two Oscars. I conjured up solutions to many of the world’s problems and, sometime around Day Three, realised a solution for the secret of perpetual motion and remembered the lyrics to all of Pink Floyd’s ‘Dark Side of the Moon’. All of which, I am sure you will agree, are useful things to have considered. Jean-Jacques Rousseau claimed to be incapable of thinking, composing, creating or being inspired unless he was walking. I don’t suppose he is alone. Psychologists have demonstrated the value of daydreaming, of allowing our minds to wander, apparently without a specific aim. Ensnared by the needy beeping and buzzing of our mobile devices, we city-dwelling, 21st century, plugged-in people tend not to gaze out of the window on a train journey and an empty page in our diary might seem like an admission of productivity failure. Long-distance walking is the antidote. Descending from Monte Mario, I follow the signs pointing towards the Holy Door. In late 2015, Pope Francis declared that 2016 would be an “Extraordinary Holy Year of Mercy” for Catholics. Occurring only every 25 years, on average, Holy Years see special celebrations and are popular years for pilgrimages. At the Vatican, The Porta Sancta (Holy Door), which is usually sealed behind bricks and cement, is ceremoniously opened, revealing a special entrance to St. Peter’s Basilica. 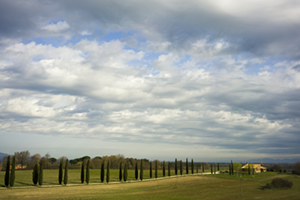 During Holy Years, the Porta Sancta is believed to bestow the love of God upon pilgrims who pass through it. Describing the interior of St. Peter’s Basilica is beyond my poor vocabulary and after days of quiet contemplation, I see no need to do anything more than gaze in silent wonder. Outside in the expanse of St. Peter’s Piazza, the realisation that this goal had been reached and this journey completed hits me and I discover that I don’t have anything else in my diary today. So, in what my feet conclude is an unexpected decision, I choose to carry on walking. I walk beside the Tiber as far as the Spanish Steps and try to recall those Pink Floyd lyrics. Back in the bustling city streets, my thoughts don’t stick long enough to complete that one task. It is clear that I need to return to the meadows, olive groves and woods as soon as possible before the secret of perpetual motion escapes me too. Gavin Gough is a freelance photographer and writer. His work for editorial, commercial and NGO clients has received wide recognition, and described as “original, very social, with a particularly humanistic way of seeing the world and its people.” Gough’s documentary work in Asia, African and the Indian sub-continent has been published in The Guardian, New York Times, Telegraph, National Geographic Traveler, GEO and others. His images have been exhibited in London, Bangkok and New York. 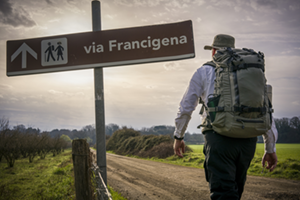 *Gavin walked the Via Francigena from Viterbo to Rome with CaminoWays.com. Pilgrimage to Rome was originally published by Thai Airways Sawasdee Magazine in April 2016.